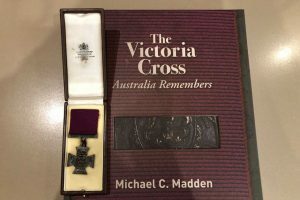 Berwick based author Michael C. Madden has produced a remarkable book that collects the personal stories of 100 of Australia’s most remarkable soldiers, all recipients of the Victoria Cross (VC). Produced in conjunction with the TPI (the Totally & Permanently Incapacitated Ex-Servicemen & Women’s Association of Victoria), the sizeable 420 page coffee table book is available through the TPI website, with a few of the limited edition boxed hardbacks also available. It took Madden four and half years to write the book, the first ever collection of stories of every soldier to receive the most prestigious military award in the country. Madden even interviewed an MNS member on their discovery of Alexander Stewart Burton’s Victory Medal. Madden has dedicated all profits of the book to the TPI. The TPI was formed in 1926 and has a long and proud history of providing Welfare, Advocacy, Benefits, & Concessions along with supporting its Members, their Families, Dependants and the broader Veteran Community over the past 90 years.